Whether you are new to TIMSS and TIMSS Advanced and their extensive scope, or simply looking ahead to the International Release in November, here are some key facts and figures. The results will be released on November 29, 2016, at 10 a.m. Central European Time at timssandpirls.bc.edu. They will include a video and infographics detailing major findings. 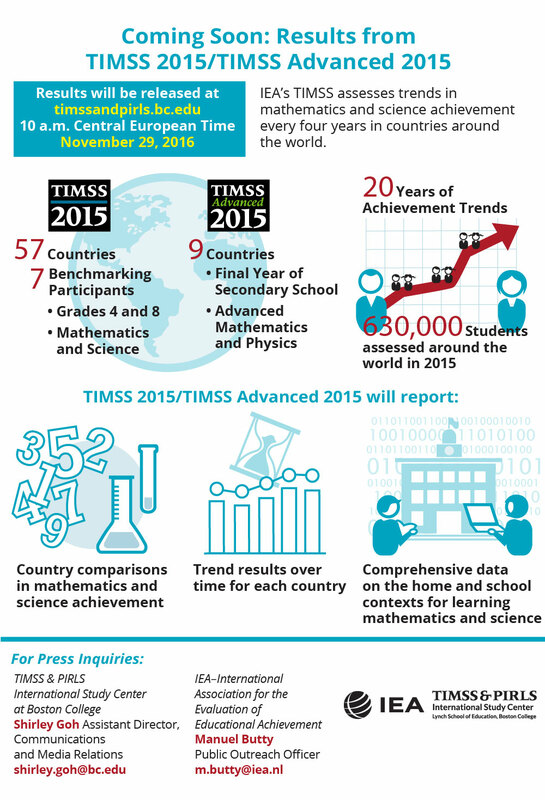 With TIMSS 2015, IEA's TIMSS reaches a landmark 20 years, along with two decades of educational trends. TIMSS enables countries to make evidence-based decisions on how best to improve student learning, using rigorous and reliable data. TIMSS monitors trends in student achievement in mathematics and science, together with extensive information about students’ home, school, and classroom contexts for learning those subjects. TIMSS assesses students at the fourth and eighth grades — targeting the end of the primary and middle school cycles, while there still is an opportunity to improve students’ achievement. TIMSS Advanced is the only international assessment that monitors students in STEM programs and tracks in their final year of secondary school. In TIMSS 2015, 57 countries and 7 benchmarking participants were assessed, and TIMSS Advanced 2015 assessed 9 countries. More than 630,000 students were assessed around the world for 2015. TIMSS works closely with colleagues in the participating countries to assess the mathematics and science that students are expected to know and be able to do according to curriculum guidelines and instructional emphases. TIMSS collects data from countries about their official curricula, and from teachers about whether students have been taught the TIMSS topics. TIMSS has a balanced approach to assessing knowledge, applying, and reasoning skills (two-thirds of the items measure application and reasoning). TIMSS & PIRLS International Study Center is located at the Lynch School of Education at Boston College, and is led by Dr. Ina V.S. Mullis and Dr. Michael O. Martin, executive directors. The IEA (International Association for the Evaluation of Educational Achievement) Secretariat is located in Amsterdam, and its Data Processing and Research Center is in Hamburg.